We designed GetPublished for rapidly producing rich, browser-friendly technical documents with minimal effort. One of the core technologies we developed for this purpose is our "Document Adapters" which transform a variety of document formats into html. Here are some easy document formatting tips for getting great output with minimal formatting effort on your part. 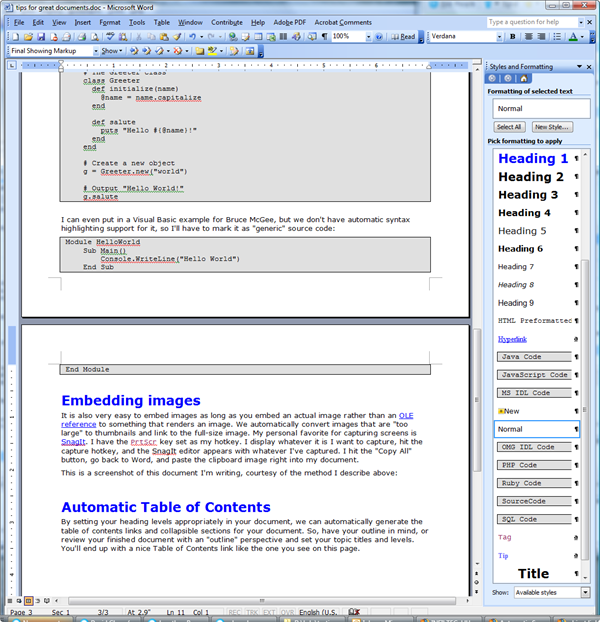 For most of the in-depth documents I write, I use our support for Microsoft Word. This section of the document is for Word formatting tips. We have a custom Word template that includes support for special styles our Document Adapters understand. You can download it from http://gp.codegear.com/files/CodeGear.dot. (This link is available on the bottom left of the GetPublished home page.) After downloading it, make sure the file extension is .dot. I have a desktop shortcut to our document template. Whenever I want to create a new document, I just double-click that shortcut and start writing. We have support for automatic syntax highlighting via our document adapters. Paste your source code into your document, select Format|Styles and Formatting and click on the appropriate source code style. All the selected text becomes highlighted in gray, with a monospaced font. If you are documenting an unsupported "source code" language, use the default "SourceCode" style. To show how easy it is, I've put in some samples of source code style selection. I would like to thank Jonathan Benedicto, David Clegg, and Wayne Niddery for some quick representative "Hello world!" examples when I nagged them on Skype. It saved me from having to actually think. It is also very easy to embed images as long as you embed an actual image rather than an OLE reference to something that renders an image. We automatically convert images that are "too large" to thumbnails and link to the full-size image. My personal favorite for capturing screens is SnagIt. I have the PrintScreen key set as my capture hotkey. I display whatever it is I want to capture, hit the capture hotkey, and the SnagIt editor appears with whatever I've captured. I hit the "Copy All" button, go back to Word, and paste the clipboard image right into my document. Note that this image has a thumbnail and a link to the full size image. That's because it's larger than our configured maximum for height or width of an image for this type of document, so it's automatically converted into a thumbnail and link. We also support captions for images. You can right mouse click on the pasted image, select "Caption …" and put in a caption. Because this image is small enough, it is not converted to a thumbnail. By setting your heading levels appropriately in your document, we can automatically generate the table of contents links and collapsible sections for your document. So, have your outline in mind, or review your finished document with an "outline" perspective and set your topic titles and levels. You'll end up with a nice Table of Contents link like the one you see on this page that supports direct jumping to various sections of your document. We also support collapsible sections of the document, all from automatically converting it to html. By default, word usually creates hyperlinks for you automatically. If you have turned off this feature, you can create a hyperlink by highlighting the text you want to convert to a link and pressing Ctrl+K, or by right mouse clicking on the highlighted text and selecting "Hyperlink …". We have similar document adaptation support for the other formats we support, such HTML and Wiki. To learn more about what you can do with GetPublished, see our online Help section.